Wow your clients with a thoughtful & amazing holiday gift this year! You may think that handing out imprinted holiday gifts to your clients is out of your budget or price range. With that we say, how much are your ongoing clients worth to you? You don’t necessarily have to be lavish with every client, but spending a couple dollars will make them feel that their business is appreciated, and you can ensure they’ll keep coming back to you for their needs. By having your logo imprinted on the gifts it is a polite way of reinforcing your brand & company. 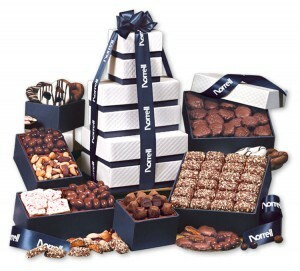 Food gifts are an excellent way to share the holiday spirit with your employees, clients & business associates. I mean, what better way to say thank you than with chocolate! Of course, there are other edible yummies as well. Calendars are one of the best things you can give people to help them think of your organization literally every day… and the Holidays are the perfect time to send them to your top clients or prospect. Look at the calendar on your desk or wall, chances are it has a logo on it! 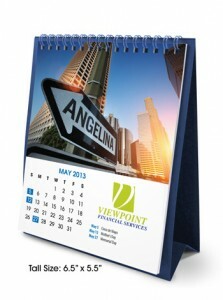 We highly recommend image personalized calendars! 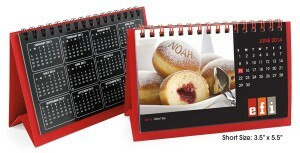 Think about it – no one will throw away a calendar with their name on it. Guarantees your customers will see your company name everyday.